Colette Abrahams, 5, and her brother, Tristan, 7, ski down Buttermilk for opening day on Dec. 8. The folks at Snowmass Village could be forgiven for considering this year’s readers’ survey on ski resorts by Conde Nast Traveler as Conde Nast-y. Snowmass finished the worst among Aspen Skiing Co.’s four ski areas in the travel magazine’s 2018 Readers’ Choice Awards. Snowmass managed 15th place. Upsetting its bigger sister at 14th was the Milk. Snowmass got high marks for its size and diversity. 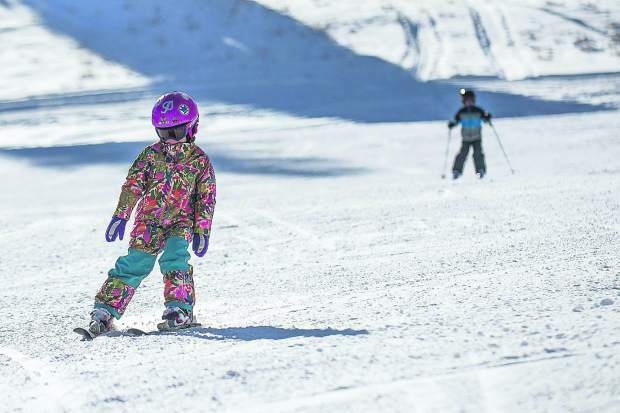 “The most expansive of Aspen/Snowmass’ four mountains also has the most vertical feet of terrain the U.S., with a 4,406-foot elevation drop (as well as enough variation to make it an all-around hit with families),” Conde Nast said regarding Snowmass. “Aspen Snowmass’ four mountains are each wildly unique, and Buttermilk might (be) the most playful,” the magazine said. Aspen Mountain placed eighth, one notch ahead of Vail. Aspen Highlands placed best among Skico’s four resorts by coming in at seventh. “Of the four mountains that make up Aspen-Snowmass, the ultimate rite of passage is here at Aspen Highlands’ massive Highland Bowl,” Conde Nast wrote. For the record, the top resorts from sixth to first were Sun Valley, Whistler/Blackcomb, Whitefish Mountain Resort, Lake Louise Mountain at three, Deer Valley at two, and Telluride at the top spot. In SKI Magazine’s annual resort assessment, Aspen-Snowmass was ranked “Resort of the Year: Best of the West” this year. It was considered as a whole rather than as four individual ski hills.